AVS Video ReMaker program is an easy and quick way to cut unwanted scenes out of your movie without any need to re-encode the file. This application has a user friendly and intuitive interface which enables to edit your video files without any difficulties. edit DVD and Blu-Ray video, add chapters, use video menu templates and burn it onto a CD-R/RW, DVD+/-R, DVD+/-RW, DVD-RAM, Double/Dual Layer. 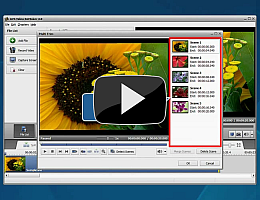 To start AVS Video ReMaker go to Start menu and choose All Programs -> AVS4YOU -> Video -> AVS Video ReMaker. What is in AVS Video ReMaker?